Nightmare New England & the legendary SpookyWorld unite to deliver one of the largest, most terrifying Halloween Scream Parks in the country! Over 100,000 Sq. ft of terror awaits you at New England's number one destination for Halloween thrills this October. The massive 20-acre Scream Park features SEVEN heart-racing haunted attractions at ONE monstrous location. Dozens of freakish characters stalk the grounds and roam freely in the woods lining the property. The Monster Midway hosts live music, go-karts (voted #1 in NH! ), batting cages, two themed mini-golf courses, concessions, restaurant, bar, photo opportunities, gifts and more! The variety and scale of Nightmare New England and SpookyWorld offers something for even the boldest of Halloween fanatics. Leave it to us to make your Halloween an unforgettable experience. 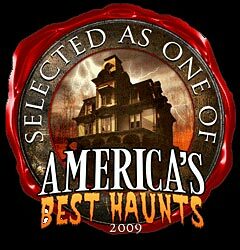 Check out our Attractions page for more information about Buried Alive, NightFeeders, Raven's Claw Cemetery, House of Eternal Darkness, The 3-D Freak Show, Demented and Sleep Stalkers! CONTACT . MAILING LIST . LINKS . PRESS RELEASES . PRIVATE PARTIES & SPONSORSHIPS. SpookyWorld joins forces with Nightmare New England in one location to create the most terrifying haunted house & Halloween attraction in all of New England. Nightmare New England has an incredible midway full of games and events all located at Mel's Funway Park in Litchfield, N.H. The park features incredible and horrific walk through attractions which will give you the Halloween thrill of a lifetime. Please browse through our website to learn more about us. You can follow us on my space, twitter, face book and we also have commercials and videos online. In addition to the Haunts you will experience, Nightmare New England has concessions, food and carnival style games. From ice cream and pizza, to fried dough and seafood; featuring the original fried clam! The Park is a destination location for all. Nightmare New England also has designated locations for your corporate function or for that special event or birthday party - make it an unforgettable day and night at Nightmare New England. Looking to get your name out to the public more, especially with your target audience? Nightmare New England offers sponsorship solutions as well. Contact us to find out more! View our schedule page to see all the dates and times that we are open this October. Would you like to act in our haunts, signup with our online application form. Can't get enough information, please feel free to join our mailing list, fill it out online and receive specials and updates. We also offer private parties and sponsorships. For your convenience, you can buy tickets online and save time! Make sure to check out our directions page, we hope to see you this October. If you enjoy being scared for Halloween, then your #1 choice is Spookyworld & Nightmare New England!